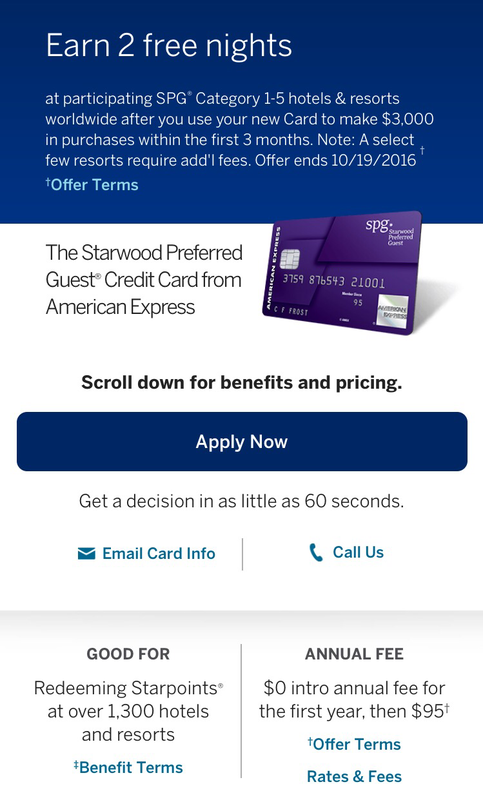 A few weeks ago I posted how there was a strong rumor that the signup bonus on the Starwood American Express cards would be changing and sure enough, the signup bonus has now changed to a brand new and different type of offer. Instead of points, the signup bonus for both the personal and business card is for 2 free nights at any category 1 to 5 SPG hotel. This new offer is valid to 10/19. Here is the direct link to the personal SPG card and a direct link to the business card offer. This new offer is quite interesting so here are a few things to consider about this new offer as this offer is really worth a maximum of 24k to 32k Starpoints if redeemed at the highest level category allowed, a category 5 hotel. American Express limits an individual to only one signup bonus per card in their lifetime. As such, it is imperative to only apply for an Amex card when an offer is at its peak. While this offer does not match the best over ever of 35k points, see points #2 & #3. There is no doubt that the previous 35k (and the 30k with one specific exception) were stronger offers as per the award chart below a free night at a category 5 hotel would cost between 12k to 16k points. So at best this offer is potentially only better if redeemed for category 5 hotels. Are you sure you will redeem two free nights at a category 5 hotel? If not, take the points offer. If you are sure you would redeem at a cateogry 5 property, will it be during the hotel’s high season where it could cost 16k points a night? If so, take this new offer of free nights. Do you want flexibility to use points for lower level SPG hotels and/or transfer some points to airline miles? Take the points offer. In short, I’m disappointed by this offer as in most cases the 25k offer is better and I was really hoping to see a 30k or 35k offer. Interestingly the refer a friend offers only show the old 25k offers for both the personal and business cards. I’m not sure if Amex is still updating those links or if it will be possible to choose between the free nights offer (public link) or points offer (refer a friend links). Additionally this offer is only through 10/19 so you could potentially wait for the public 25k offer to return. If you would like to support the blog and my efforts as a non-affiliate links blogger, I can refer others for either Starwood card as I am a current cardholder for both the personal and business card versions. I do receive 5,000 Starpoints for referring you but you will receive the 25k offer via email from American Express. If you are interested, here are my referral links. Alternatively, you can leave a comment asking for a referral (only I will be able to see your email address) or email me directly at ralph@pointscentric.com and I will promptly refer you for the card. Thank you in advance for your support! Update: Coworker of mine mentioned referral email will say 25,000 points in the body of the email but when you click to apply, it shows the 35,000 point offer. 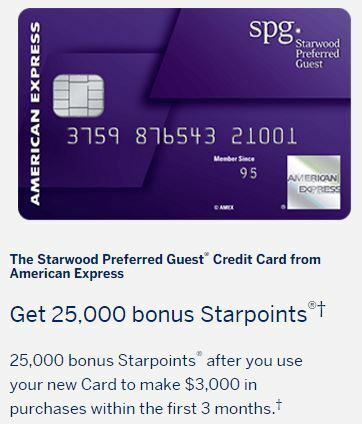 This is going to be mentioned ad nauseam around the blogosphere (once the bloggers get their affiliate links of course – no wonder why it is quiet thus far this morning) so I’ll make this quick but the offer on both American Express Starwood cards has increased to 35,000 Starpoints. You need to spend $3,000 in 3 months for the personal card and $5,000 in 3 months for the business card. This new offer is valid to March 30, 2016. This is the new highest ever public offer on this card as part of me wonders if American Express is looking to get as many cardholders as possible before the Marriott-SPG merger. 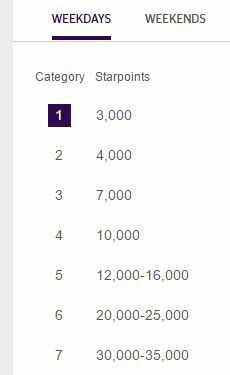 SPG points are among the most valuable (if not most valuable) points out there as these 35,000 points could easily cover a few nights in Starwood hotels or the points could be transferred to many different airlines at a great ratio. In fact you can think of this signup bonus as 50,000+ miles in programs like Alaska, American or Delta as you earn a 5,000 mile bonus for every transfer in increments of 20,000 points. After meeting the spend on the business version (or completing $5k of spending on the personal even though you need spend of just $3k for the signup bonus), you will have 40,000 SPG points which converts to 50,000 miles as mentioned. If you would like to support the blog and my efforts as a non-affiliate links blogger, I can refer others for both Starwood cards as I am a current cardholder of each version. 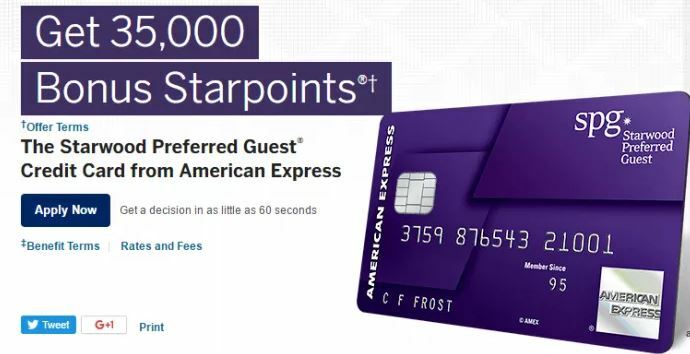 I do receive 5,000 Starpoints for referring you but you will receive the same 35,000 point offer via email from American Express. If you are interested, please leave a comment asking for a referral (only I will be able to see your email address) or email me directly at ralph@pointscentric.com and I will promptly refer you for the card. Thank you in advance for your support! I do recommend applying for this card now assuming you never had either card (my wife will be applying for the business version) as you know at the time of application, you are getting the best ever offer on both SPG cards. With the future unclear on how long SPG lasts, I’d rather lock in an easy 35,000 SPG points (or 50,000 airlines miles) before the program goes away. Make sure to reach out to family/friends for a referral link if they have this card or please consider supporting the blog and letting me refer you. There are several promotions or other noteworthy items that are expiring or changing on March 1st so I put together a quick to do list as you are hopefully enjoying your Sunday. 1) Use your expiring Hyatt Diamond Suite Upgrades (especially for March 2017 stays) – I don’t need to rehash the changes in full about the Diamond Suite Upgrades – in short, Hyatt is changing the policy that you can’t use them for stays after they expire. However, they are letting you book any remaining suite upgrades (the ones that expire tomorrow 2/29) for stays after they expire. My advice is to first use these expiring suite upgrades for any March 2017 stay first. Why? 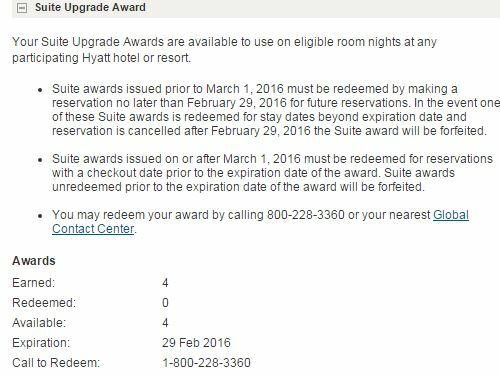 When the new 2016 Diamond Suite Upgrades are released in March, I presume they will expire 2/28/17. With the new policy, you will not be able to book any trips for March 2017 using a DSU until the 2017 Suite Upgrades are released on 3/1/17 – that kind of stinks as it forces you to use it last minute (if even available) for a March 2017 stay. But you can book those March 2017 stays now using your 2015 DSU that expire tomorrow. It seems strange but it’s true. Unfortunately, you can only book 13 months in advance on Hyatt otherwise I would recommend this strategy for any possible 2017 stay. Now I understand many people don’t know about their travel plans ~13 months in advance but if you have any inkling of a trip you’d like to take that would involve a Hyatt Diamond Suite upgrade, I’d book it now knowing you can always cancel it later for free (though you obviously lose the DSU at that time, which isn’t a big loss considering you are losing it tomorrow if you don’t book anything with it). 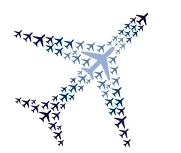 3) Consider Applying for a American Airlines Citibank Credit Card – All of the bloggers who have Citibank affiliate links have been posting non stop this week how the 50,000 mile offers on the Citibank Platinum Select and CitiBusiness AA cards are changing on Monday 2/29. While I don’t doubt they will have to take down their affiliate links for the 50k offer, I’m rather confident there will still be 50k links floating around as Citibank is known to do. It is usually possible to find a working link for many Citibank offers after they supposedly expire so I am not concerned about the change in offers. I personally don’t think anyone needs to rush out and apply for either card today but if you are risk-adverse and want to guarantee an easy 50,000 AA miles, then I guess go for it. However, I will not be nor I am recommending it to any of my clients. Here is a non-affiliate link for the personal card and business card if you must.